Widely recognised as one of the most accurate forecasts for commercial real estate trends, the new iteration of this established series offers information on all categories of the commercial real estate industry. 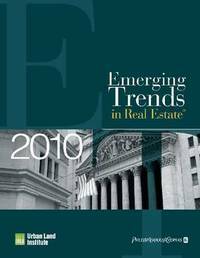 Based on interviews with leading real estate authorities, the manual offers advice and predictions on all of the important variables of U.S. markets, including investment trends, capital markets, markets to watch, and what is happening in multifamily, retail, office, industrial, and hotel development. A priceless resource, this is a must for any serious investor looking for a helping hand.